It's (sort of) summer, which means it must be time for Skylark Opera's Summer Festival! Every year they present two shows in repertory, typically classics from musical theater or operetta. The last two years I've attended one of the two shows, but this year I was able to see both. Unlike in past years, there is no overlap in cast or orchestra between the shows. 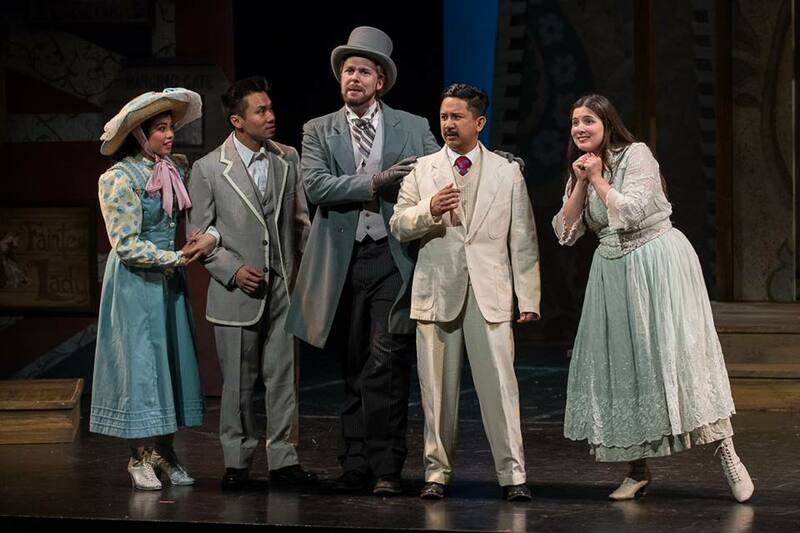 Another new feature this year is that The Mikado is being presented in collaboration with Mu Performing Arts, which continues their tradition of the past few summers of putting a new and Asian-American spin on a classic (they've previously done Into the Woods and Little Shop of Horrors). This year they reinvent Gilbert and Sullivan's The Mikado, famous for not only its music but also its stereotypical representation of Japan. But first up - the world's longest running musical. This small-scale musical opened Off-Broadway in 1960, where it has played almost continuously ever since. I saw it there four years ago in the Jerry Orbach theater (named after its most-famous and well-loved original cast-member), and was absolutely charmed by it. I'm happy to report that Skylark Opera's production is just as charming, funny, silly, smart, wacky, and entertaining. 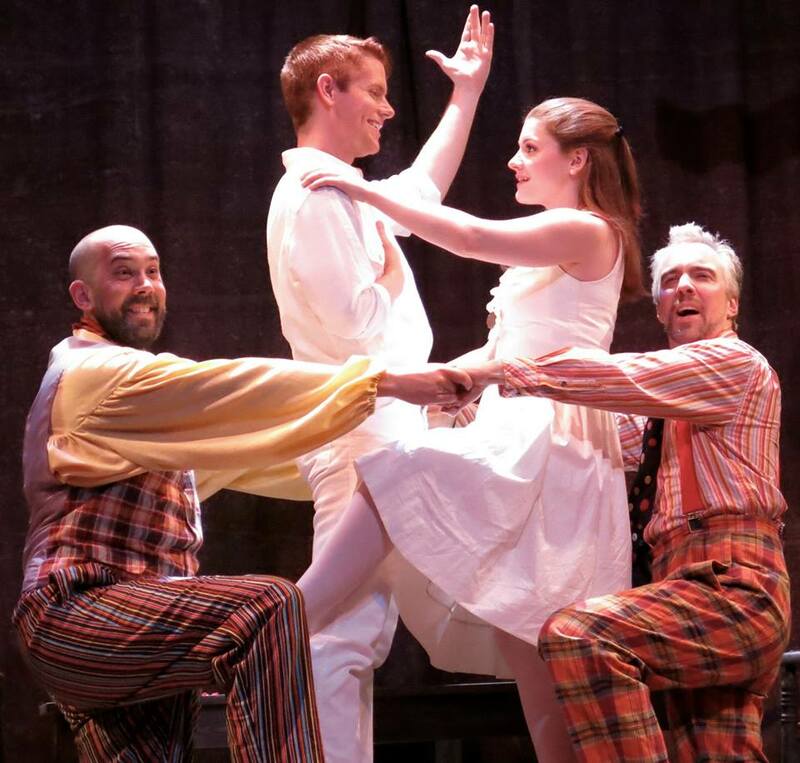 The Fantasticks is a fantastical story that also rings true. It's a love story, but with a sharp edge so that it's not too sappy. A boy (the charming and charismatic Matt Berdahl) and girl (the equally charming Quinn Shadko, with a lovely voice) fall in love, living next door to each other on opposite sides of a wall. The wall was put up by their fathers (Jeffrey Madison and Paul R. Coate, who are hilarious and sound fantastic together), seemingly to keep them apart. But it's a bit of reverse psychology, as the two are pals who really want their offspring to marry. They arrange a kidnapping with the smooth and seductive bandit El Gallo (Gabriel Preisser, possessing the necessary height, deep voice, and devilish smirk). Everything goes as planned and the couple are happy together. Until the second act, when they get bored with and annoyed by each other. They go their separate ways to experience the world on their own, and find out things aren't so great out there after all. This is a small cast for a musical, with a small onstage two-person orchestra (Min Kim on harp and Andrew Fleser on piano). There is a bit of stage magic in the use of props and confetti, all supplied by the graceful Penelope Freeh, who never utters a word as she guides the story along (she also nicely choreographed The Mikado). In addition to a lovely and lively score which includes the wistful "Try to Remember" and the love song "They Were You," the play also features some poetic monologues by narrator El Gallo. It's a strange and delightful mix of a play, with music, sword fights, slapstick comedy, a sense of melancholy, a bit of cynicism, and also the hope of young love. No wonder it's the longest running musical in the world! There is a curious paradox that no one can explain. Who understands why spring is born out of winter's laboring pain? Or why we all must die a bit before we grow again? And myself a little bit, too. The English writing duo Gilbert and Sullivan are famous for their fast and clever lyrics and witty satirical send-up of the British establishment (see also HMS Pinafore). They set one of their most popular works, The Mikado, in Japan, which "allowed Gilbert to satirise British politics and institutions more freely by disguising them as Japanese" (Wikipedia). In doing so, they also play on stereotypes of Japan, and many productions throughout its history have employed yellowface (casting Caucasian actors as Asian characters). Mu has attempted to remedy the situation by rewriting some of the libretto and casting Asian actors in the main roles, thereby eliminating the offensive stereotypes while keeping the charm and wit of the original piece. 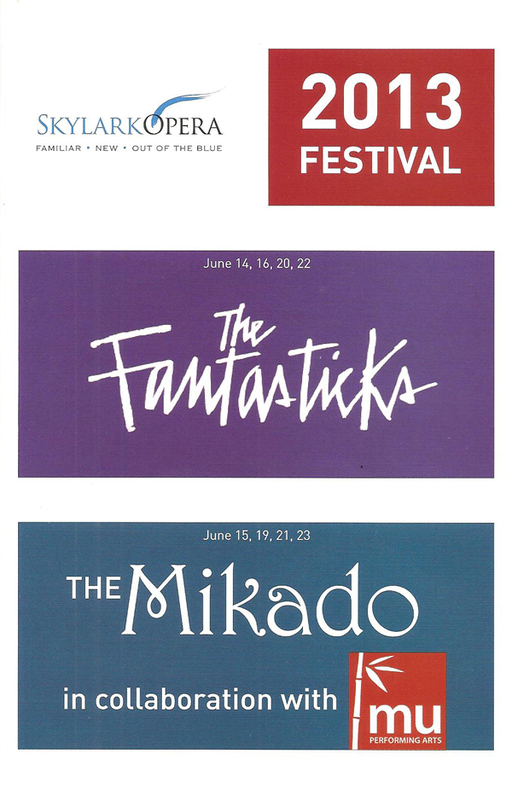 I've never seen another production of The Mikado so I can't speak to what has changed, but I like what I saw, and I trust that Mu did it right (because they usually do). In the fictional town of Titipu, the son of the emperor (or Mikado) is disguised as a traveling musician (a second trombone). Franki-Poo (Phong Nguyen) is looking for his love, Tum-Tum (the adorable Isabella Dawis). Sadly for the lovers, she is the ward and betrothed of the Grand High Executioner Co-Co (Randy Reyes, hamming it up in the best possible way). Because of the complicated laws of the land (which include a mandatory punishment of beheading for the crime of flirting) and Franki-Poo's desire to die if he can't be with Tum-Tum, Co-Co grants them permission to marry for a month, after which time Franki-Poo will be executed and Tum-Tum can marry Co-Co as planned (do you follow?). This crazy plan is approved by Co-Co's right hand man Pooh-Bah (from which we get the term pooh-bah), played by the very entertaining Alex Ritchie. The Mikado himself (an impressive James Ramlet) appears in the second act and plans must be changed. Co-Co woos Franki-Poo's previous betrothed Katy Shaw (Ashley Cutright, with a voice that fills the theater) so that Franki-Poo can confess his true identity, marry the woman he loves, and not be executed (still following?). Yes, it's a silly and convoluted story, but it's great fun. The songs are fast and funny, especially those that have been rewritten with modern references. This huge cast of over two dozen sounds amazing when they all join their voices together. Along with the gorgeous 20-piece pit orchestra (directed by Steve Stucky), the sound coming from these singers and musicians is full and lush and layered. I appreciate that Skylark presents their productions "without artificial amplification." In the proper room, with people who know what they're doing, no mics are needed, and it's a refreshing change to hear the pure and natural sound of music. I would say that if you only have time to see one show in Skylark Opera's Summer Festival, it's a tough choice which one to pick. The more intimate musical with a lovely score and whimsical nature, or the full and lush operetta with the huge cast. 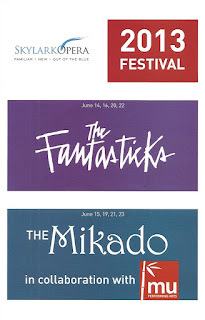 But since The Mikado is completely sold out, the choice is easy - see The Fantasticks (which, if pressed, I might choose as my favorite of the two). Only two of the total three performances remain, so act fast! Perhaps Skylark needs to consider a longer run for next year's festival. After creating these beautiful shows, it a shame that more people don't get to see them!